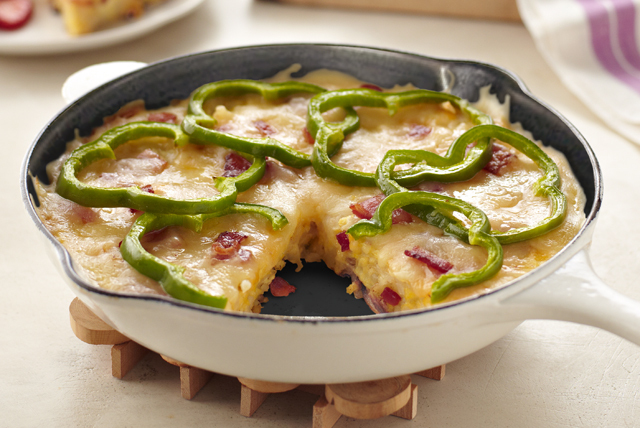 This creamy, cheesy skillet-cooked potato frittata gets a nice shot of color and flavor from green pepper rings and bits of chopped bacon. Cook bacon in medium nonstick ovenproof skillet 4 min. ; drain. Add potatoes and onions; cook 7 min. or until crisp-tender, stirring frequently. Stir in eggs. Remove from heat. Top with cheese and peppers; cover. Bake 20 to 25 min. or until center is set. Serve with fresh fruit salad and a small muffin to round out the meal. Most saucepans or skillets can be placed in an oven for short periods of time. Simply wrap the plastic handle and lid top with heavy-duty foil before adding to oven. Remember, when removing skillet from oven, everything covered with foil will remain hot for at least 10 min. Assemble frittata as directed; cook, uncovered, on stove top 10 to 12 min. or until center is almost set. Once the frittata can easily be released from skillet, slide it onto a serving plate, then carefully flip it over and return to skillet. Cook until center is set. Serve pepper-side up.